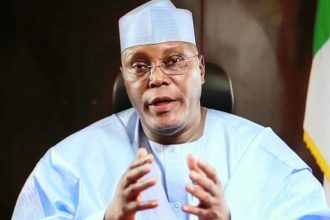 Former Vice-President Atiku Abubakar was among the few invited African Leaders to grace the second term inauguration of South-Africa’s President, Jacob Zuma in Pretoria, South-Africa. The Turaki Adamawa stormed the event in Blue Colour Blazer Jacket and a jean to match. The duo of Atiku and Jacob Zuma have over time shared a lasting and cordial relationship both in business and politics.